Anandan is an unusual teaching institution in Calcutta. 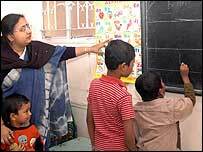 It aims to provide all-round, supplementary education to very poor slum children. It was started in 1999 by a group of middle-class housewives, among them my sister. They did a survey of slums near their homes, were dismayed by the poverty and paucity of education the children received and so they started out with 10 students and one teacher, whom they paid out of their own pockets. The aim was not to replace the children's regular schooling - whatever meagre schooling they may have been getting - but to provide additional skills - logic, elementary English and, generally, the excitement of knowledge. The hope was that a few would find their imagination sparked and would break away from the indigence into which they had been born. Over the past two years Anandan attracted the attention of sponsors, Indian and international, and has grown substantially. It has moved into its own rented premises and has more than 200 children - the slums of Calcutta having a supply to match any facility. Because of my interest in child literacy and labour, I recently visited Anandan. Initially, the children, sitting all scrubbed and clean, with their notebooks and pencils, were diffident about this "visiting teacher". After several attempts to make them talk, one of them nervously showed me her written work. And when I praised it, there were others; and soon the classroom was a sea of waving banners and smiling faces shouting answers to my questions. It was a heartening sight - never mind that some of the youngest ones, unused to male teachers, referred to me as "Miss". What was of special interest to me is that the school has collected information on the children's household conditions and kept records of aptitude tests taken by children aged nine to 16 years. If the first four numbers of a sequence are 0, 3, 6, 9, what will the fifth number be? If the first five numbers of a sequence are 1, 0, 12, 0, 123, 0, what will the seventh number be? Almost everybody got the first one right (sandesh), more than half got the second one (12) but virtually no-one got the last one. There were also general knowledge questions, like: which is the highest mountain peak in the world? Most got it right though there were a few exotic answers. My favourite was the one from the boy who insisted it was Switzerland. This data allow us to study what influences a child's intellectual skills. My interest in this subject arose from a different kind of finding on child welfare that was implied by the work of economists, Shelley Lundberg, Robert Pollak and Terry Wales, based on UK expenditure survey data. One standard way to help a poor child that has been used through the ages is to give an income supplement to the child's parents. Not much thought was given to who the money should be handed to. Can a child's intellect be affected by his household background? In Britain, prior to 1977, a child tax allowance (CTA) was given to households with children below 16 years of age. The allowance was given, typically, to the father. Then, over the next two years, the CTA was replaced by a lump-sum payment called Child Benefit, which was paid directly to the mother. Exploiting this change of policy, the economists were able to demonstrate that who brings the money home makes a difference to child welfare. Expenditure on children's clothing, for instance, was higher if, with total income remaining the same, a larger fraction came from the mother. Subsequent studies have tried to show that, more generally, a rise in the woman's status in the household tends to positively impact on the children's economic well-being. From the data from Anandan it is possible to seek an answer to a different but related question: Can a child's intellect be affected by his or her household conditions? What a first analysis of the numbers show is quite striking. A child's aptitude correlates very little with a variety of indicators like the child's mother tongue (the school has Hindi and Bengali-speaking children), the number of siblings the child has or, more surprisingly, even the income and wealth of the child's parents. But one variable that stands out as a strong correlate is whether the mother chats a lot with the child and, more surprisingly, whether the mother and the father chat a lot among themselves (this reflects, more than anything else, the status of the mother). If the answer to these is yes, then the child's aptitude is likely to be significantly higher. These are preliminary findings. One will have to do further tests to tease out the direction of causality. Hence, for now, these results must be handled with caution; but, nevertheless, it is remarkable that variables, which are so far removed from a child's answer to the aptitude questions above, seem to influence them so significantly. And, finally, for readers interested in question three, the answer is: 1234. I am attempting something similar with a few Govt. primary schools in the slums of Bngalore and have had reasonable amount of success. Though not much research has gone in to my programme, my experience of the last 4 years of association with these schools has been invaluable and are largely matching the findings of ANandan. It is not the question of slum children or other poor children, with the technically advancing world, the whole system of teaching these young and under-priveleged children cries for a technical change. When the affluent children learn through computers, other deprived children like slum children and children from the unaffordable families need to be emancipated of the divide if at all they are to be brought to the centrestage of learning. So my inference is teaching the slum children in a primitive method of dumping them in garret like class-room will make no wonders unless the teaching through electronic medium like computers is considered a method-paramount. Slum children are ofcourse equal human beings and they richly deserve to be taught through visual medium to be able to stay abreast with the priveleged children. Computers are here to stay not only to change the World but the Slums wherever they are in the so call World. It was a pleasure reading your article. There are many more efforts like Anandan, successful or failed. Even in failed efforts (my daughter was involved) I observe it is the excitement of knowledge which lasts long. Children get so little that they remember the excitement. An interesting as well as touching article. While I was in India I was very much tempted by the idea of providing underprivileged children an opportunity to gain some knowledge and as a result I started participating in college level NSS activities, but which had mainly to do with Aids awareness. But it is so good to know that amongst a whole lot of commoners, there are people who give form to wishes and ideas. I wish Anandan good luck in the New Year and good luck with its mission. The British colonials destroyed the free education system of India in the 1700-1800s, rudimentary as it was but still far superior than anything seen in backward Europe at that time, by taxing the poor Indian villagers to starvation. We now know with almost a sense of disbelief that a large part of India did have a sustainable education system, as late as even the early years of the 19th century, and that this was systematically demolished over the next 50 years by our wonderfully civilised looters. Although there may not be a direct nexus between the wealth of a household and the aptitude of its children, the connection between prosperity and disposable time which can be used for the education of the young cannot be denied. Families that bear the privilege of allowing both parents to spend an equal and significant amount of time with the children due to a lower level of economic tension simultaneously bear children more likely to develop into the most avid students. Very interesting. But you have to consider the innate, inborn intelligence of many slum children. Many of them are gifted. Given a proper environment to express themselves, to learn, I think we will see more surprises. This finding may seem surprising to others, definitely not to me. What is most important to children's growth is not income or status of parents, not toys or clothing. What is essential is interaction. If a child is talked to and WITH by adults and peers, they learn the fundamental principles of communication, absorbing ideas from others and framing their own thoughts and opinions in appropriate language. The other fundamental thing the interaction with parents, adults and other children develops is a child's own sense of value. If no one bothers to talk to them, they feel they have nothing to contribute. How sad and isolating; thus, they withdraw, and can resent this later. Talking, playing or reading with parents is sharing self worth and recognising individual value. It was enlightening to read this article. I had worked with street children in Addis Ababa in the early 90s with a non profit organisation called People in Need. I specifically remember a young man who eventually graduated in engineering from Arba Minch University and he is helping his siblings who have been orphaned. These children are like any other children. At the present People in Need supports over 40 children to attend school and take care of their families. I think your conclusions might just be with basis. In my limited experience as a student and in interaction with other parents and their children (mainly my friends) I have noticed that many high scorers tend to be those that have supportive parents and households with little controversy. A more detailed study would indeed be beneficial to the children of this world and I believe they deserve that. I also worked in a very small project started by six of us working in Delhi, teaching slum children. There is nothing more satisfying than knowing that when I went back last year, two of those kids had passed class 10 exams (equivalent to GCSE) from open school. I wish that all these small initiatives could be loosely bound together so that we could all learn from each other while still maintaining our local flavour within these projects.